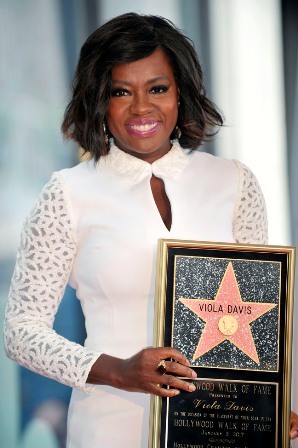 Actress Viola Davis received the 2,597th star on the Hollywood Walk of Fame Thursday January 5, recognizing a film career that has brought her two Oscar nominations and whose latest film has made her a strong candidate for a third. Meryl Streep, who co-starred with Davis in the 2008 drama “Doubt,” which brought Davis her first Oscar nomination, was among those joining her at the ceremony in front of the Marshalls store on Hollywood Boulevard, across from the Hollywood Roosevelt Hotel. She noted that the ceremony was being held in the midst of Hollywood’s awards season, when all of the attention is on winning. Davis has received Golden Globe and Screen Actors Guild Award nominations for her portrayal of the wife of Denzel Washington’s character in “Fences,” a role that brought a second Tony. Davis is also the recipient of an outstanding lead actress in a drama series Emmy for her starring role in ABC’s “How to Get Away with Murder,” the first black actress to receive the award. Born Aug. 11, 1965, in St. Matthews, South Carolina, and raised in Central Falls, Rhode Island, Davis began her acting career in theater after graduating from The Julliard School. She made her Broadway debut in 1996 in “Seven Guitars,” which was also written by Wilson. Davis’ other stage credits in­clude the Roundabout Theatre Com­pany’s 2004 off-Broadway production of Lynn Nottage’s play, “Intimate Apparel,” which brought her an Obie award. Davis’ extensive film credits also include “Suicide Squad,” “Won’t Back Down,” “Extremely Loud & Incredibly Close,” “State of Play,” “Law Abiding Citizen,” “Eat, Pray, Love,” the Steven Soderbergh-directed films “Solaris,” “Traffic” and “Out of Sight,” and “Syriana,” which Soderbergh produced for director Stephen Gaghan.